MAJOR OPERATIONS UPDATE: Good news Spectres! Starting with Operation EXORCIST, N7 Weekend Challenges will extend to the PlayStation 3 platform. Read on for all the details. By now it is no secret that the Reaper War has had its share of logistical SNAFUs. It is to the galaxy’s credit that, when we put out the call for volunteers, we were answered by individuals of every species from Citadel, Traverse, and even Terminus space. Unfortunately, the diversity of equipment sources meant our allies ran into hardware and software incompatibilities. These brave men and women have been fighting beside you and, in doing so, have gone above and beyond normal duty. Because their units were not properly tracked, they fought without pay and sometimes without proper training, equipment, even rations. It is a mark of their character that these warriors took the grave task set before us and stuck it out through sheer determination. It is time to honor their service. A volunteer task force has fabricated the necessary hardware and is rolling out compatibility software. When these installations are complete, these soldiers will benefit from being properly equipped and combat-ineffective troops will get off the bench. We’ll all have more comrades watching our backs, and we’re now watching theirs. Allied Goal: Kill 1,000,000 Cerberus Phantoms. MAJOR OPERATIONS UPDATE: Good news Spectres! 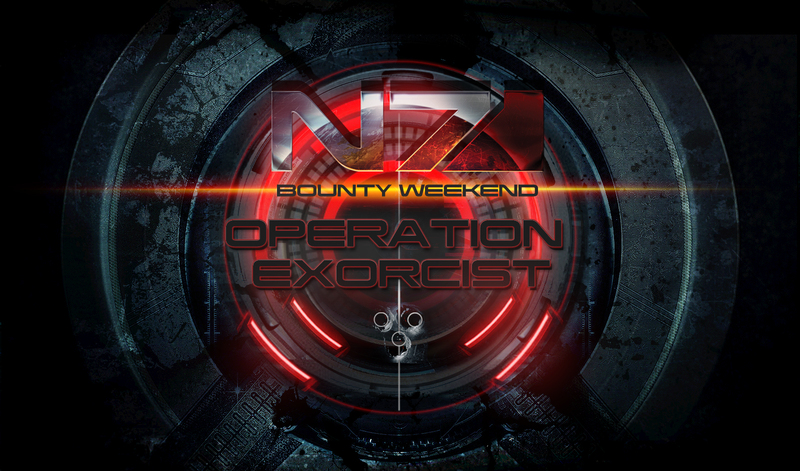 Starting with Operation EXORCIST, N7 Weekend Challenges will extend to the PlayStation 3 platform. Operation EXORCIST begins today, April 27th at 6:00PM PST until April 30th at 5:00PM PST, on PlayStation 3, Xbox 360 and PC. Please remember to set the “Upload Gameplay Feedback” setting to “On” in the online options to be able to participate in this N7 Operation. UPDATE: Please note that due to a known issue, PlayStation 3 users will not see the promotion screen but they will be participating in Operation EXORCIST and will be rewarded.